← Remember That Wind We Were Talking About? They will look even better when ‘arranged’ into a garment! Nice yarn and I like the basket too. I especially like the vibrant, multi-colored yarn ball the knitting needles are in! Nice arrangement. With the weather getting warmer, I’m about to put my knitting needles away until next fall. 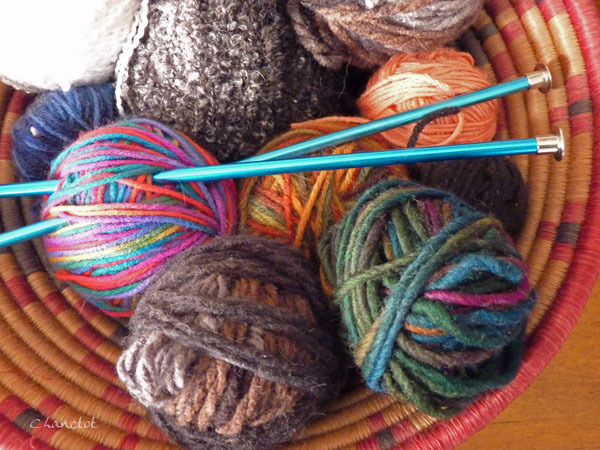 Carol, your beautifully arranged basket of knitting yarn has got me thinking about the projects I will be beginning shortly, as the weather cools down here in Australia. There’s nothing quite like knitting; I love it! I love the texture and colours, Carol. The wool comes alive and I can feel the comfort in it. Good one! But now you have to arrange it into a scarf or something! I had to laugh, Carol. For a moment your photo didn’t load. I thought you were playing the grandest April Fools joke saying you had no photo to offer. But instead, suddenly, came all this beautiful yarn. So many different colors! Ahh, but when your son brings you the basket from his trip to Africa, husband cannot complain! Husband never complains…he just rolls his eyes and grins 🙂 An African basket must have a story to tell. I love an object with a story!